These are common winter wear, very common winter-style boots. 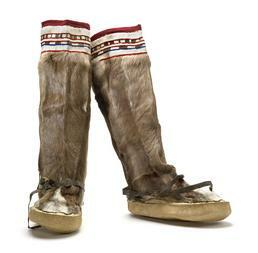 Iñupiaq women still sew this style of warm caribou-skin boot. Skins from all four legs of one animal are needed to make each boot. The top trim is now often made with imported calfskin, but white caribou fur is traditional. Ron Brower, Sr.: And they’re made from caribou leggings for winter wear. The trimming that you see¾the white¾always comes from the belly side [of the caribou hide]. And so today when they’re making these kinds of boots, they’ve switch from using the white belly of the caribou skin to using white calfskin. Jane Brower: And the front [of boot] is made from the back of the leg. And these [back of boot] are front legs of caribou. We put it on the other side. Kenneth Toovak: That pair of boots is [made with four] caribou legs. Aron Crowell: And is the sole is that ugruk [bearded seal]? Kenneth Toovak: Naluaq marra tamanna. Ron Brower, Sr.: This [sole] is ugruk. And the inner piece here [welt], that’s natchiq [ring seal]. Aron Crowell: And how bout the trim at the top? What’s it made of? Jane Brower: Caribou, the belly side of caribou [hide]. A black one and a white one. Ron Brower, Sr.: The white and the brown come from the side where it’s coming to the belly. The fur thickness is about the same, but it’s where it changes from brown to the white of the belly. Marra manna ilaaŋava sumik [what is this patched with]? Felt? Jane Brower: Akłunauraq qanuq marra. Ron Brower, Sr.: Looks like string or yarn that’s been braided and trimmed with a cloth. Ron Brower, Sr.: These are common winter wear, very common winter-style boots. They’re used for everyday wear. They could use them for hunting or . . .
Jane Brower: When we make hunting boots, we add extra [skin] to make it [boot upper] wider. And we put the warm socks inside for hunting. Karen Brewster: Would these be for men or for women? Jane Brower: I think these are women’s. Small, skinny [upper]. Aġnam kamisuŋnaŋik, aŋutillu tainna kamiqaġuurut [I think these boots are women’s, but men have these types of boots too]. Ron Brower, Sr.: Mm-hmm, both men and women wear this style of boot. 1. According to Iñupiaq Elder Martha Aiken, an isiktuuq [knee-high, caribou-leg-skin winter boot]—singular form of isiktuuk—is made with an un-oiled bearded sealskin sole, an upper made from caribou leg skin with the fur outside and made from the hide of two legs, and a welt between sole and upper. They are made fancy to wear at special events or plain for use when hunting. 2. According to Martha Aiken, to bleach seal skin a woman soaks it in salt water and dries it outdoors in freezing weather, which along with exposure to the sun, turns the skin white. 3. According to Martha Aiken, skin is sometimes scraped with the epidermis left on, which makes it sturdy and a dark brown or black color. This type of skin is often aged [rubbed] with seal oil for waterproofing. 4. According to Martha Aiken, an uŋirviaġun is a strip of sealskin, sometimes dyed, that is sewn between the boot sole and the boot upper. In English this shoe feature is called a welt. 5. According to Martha Aiken, this feature is called a siŋiq [boot strap]. 6. According to Martha Aiken, before colored yarn was available, women dyed tiŋayut [long caribou neck-hair] and sewed it in a style similar to embroidery onto qupak [fancy trim] for winter clothing. Historical sources indicate that winter boots were usually made of caribou skin, with the hair left on and facing to the outside. (6) Short-haired skin from the legs or summer hides was commonly used. Women often decorated winter boots, particularly “fancy” boots for special occasions. (12) Sometimes, strips of brown caribou leg skin and white belly skin were sewn together to make contrasting stripes. (13) Or ornamental bands of fur were added at the top, as on this pair. (14) Decorative material included white reindeer skin, obtained through Siberian trade with the Chukchi and later available from the Seward Peninsula after herds were introduced there in 1892. Boot makers used a small knife with a half moon-shaped blade—an ulu, also called a “woman’s knife,” or an uluraaq [woman’s small knife]—to cut skins. (18) No pattern or measuring tools were needed, only hand measurements. (19) Sinew thread was used, usually from caribou. (20) Boot soles have pleated edges, often referred to as crimping. Women folded up the edges, crimped them with a special tool, and sewed through each crimp to attach the sole to the boot. (21) Along the North Alaska coast, women used their teeth for crimping. (22) Boot makers in the Barrow area added a round piece of sealskin (hair on) to the heel to prevent slipping.